Airtel triple has been the cheapest, best data plan and most affordable offer since ending last year 2018 till now. Check: MTN free browsing cheat setting on Combo VPN with 0.0kb. The Airtel triple data has been available to users since last year 2018. But it's not revealed to everyone and just few users make use of this cheapest bundle in 2019. 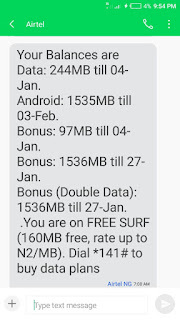 How do we benefit from this airtel triple data offer? I have decided to reveal the new way of tripling or doubling your data. This is not a cheat. This work fine on every new sim which is not up to 4 months old after the date of purchased. HOW CAN I 3X MY BUNDLE ON AIRTEL NETWORK? Let's assume you purchase a bundle of #500, which gives you 750MB. In lieu , you will get 2.2GB. That means you get 750MB bundle that you purchased. The above procedure works for all other plans, as usual, not all SIM cards are eligible for the offer if your sim is 3 months old. You just need to follow the next procedure to check if you are eligible or qualify for the offer. There are no harms in trying it. >> SMS GET to 141. Dear Customer, Congratulations! 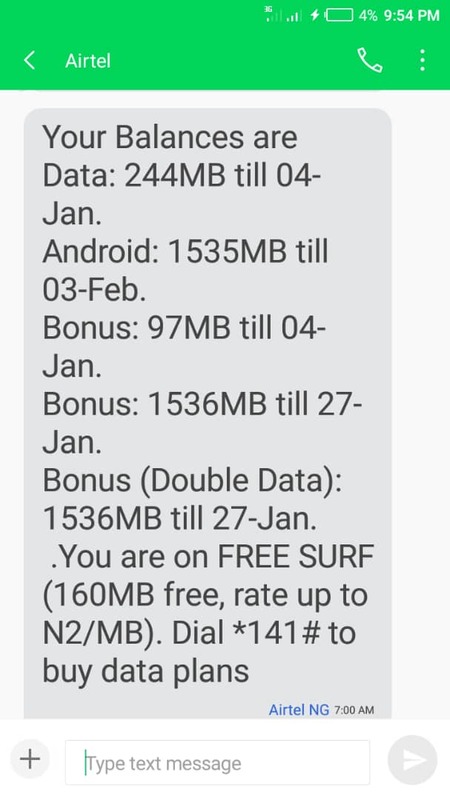 You can now joy 100% DATA BONUS ANYTIME EVERY DAY FOR THE NEXT 3 MONTHS. ✔ If you received a alert like that. That means you can continue the steps, and if you didn't receive a message like that. It means that you are not qualify for it. >> Send SMS MIFI to 141; and recharge N1000 airtime or N2000 airtime, you can not recharge N500 airtime. [*126*recharge pin#]. ✔ If your recharge was successful. Simply purchase any data bundle that the airtime can afford. Let’s say you recharged N1,000 airtime, and you subscribe to the normal plan, you should get triple data of the purchase on Airtel. Navigate to your Dialer Screen. Dial *141# and select any of your choice or dial the below code. Airtel data plan code for 1000 naira. To check your data balance. How to check data balance on airtel, navigate to your call dialer and dial the below USSDD code. *223# and you will get a USSDD pop up showing your remaining available data balance. Well, I preferred using *140# to get a message for all your bundle balances and including all BONUSES. Note: This work on all Airtel new sim just 3 months old.